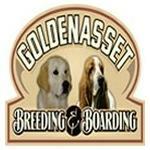 Golden Asset Kennels is a dog boarding kennel and breeder of quality English Style Golden Retrievers and Basset Hounds. Located in Everett, Ontario, Golden Asset Kennels puppies are bred for health, temperament, and conformation. They are all sold with a 24 month guarantee, CKC registered with non-breeding contracts, tattooed, de-wormed, and veterinarian checked. They have been a member of the Canadian Kennel Club since 1995.